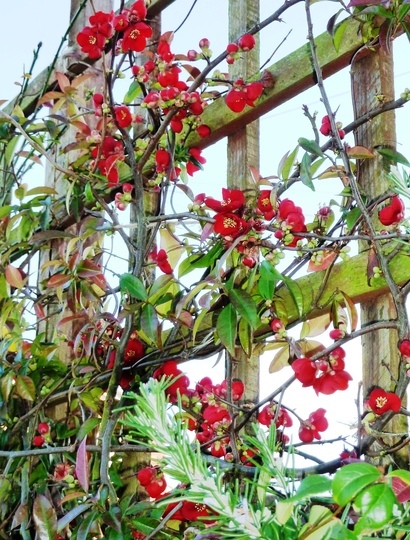 CHAENOMELES on my front garden trellis. ... and flowered well during December 2011. A gorgeous splash of colour TT! Very nice and very early, plants are getting ahead of themselves I hope we dont suffer for this later in the winter. Good to see , isn't it ? This winter's interesting :) ...but duly noted Plantoholic. I hope daylight hours are a factor in conifer dormancy as well as temperature so that expected downtime isn't too disrupted by the lack of cold. Oh my, I have never known it to bloom this early! How wonderful! I have a pink coloured one, but I prefer the red. How lovely to see that brilliant colour,Terra..It really is wonderful :o).. Yes, there is a red one like this just down the road from here and it is just starting to flower....usually flowers in March-April. Wonderful, absolutely wonderful...I wish it was like this every winter! Lovely and bright - so cheerful Terra. I love this Terra and for some reason (i've had two) they both died. Perhaps third time lucky this year.Yours looks lovely. Wow, this is fantastic Tt. Like everyone else ... I love this, Terra ... but would you please tell me how to pronounce it ... lol! Lol, Neellan ... that's one name for it! . . . . .
Yeah, I've always called it 'kee-no-me-lees' Hywel has it right I'm sure. Just highlight the link, right click and choose open in new tab, safe. Thanks everyone for your lovely comments and for explaining how to pronounce "Chaenomeles" ..... I wasn't sure ! ... and Sheila will tell us how to pronounce "Quince" ... LOL. Rose ... that's sad yours died. This one gets lots of sunshine, but other than that, no special treatment. Thats interesting Terra - I had one of these a long long time ago. I planted it in shade as thats what all the books tell you and I was in need of plants for shade. Mine died too after a few years, but never flowered as well as yours so it obviously does better in the sun. Have another go Rose! ... but, sadly, last summer, my neighbours wrenched a lot of my front fencing down, so the lower half of that side is now very exposed... I hope the quince can cope with the different conditions ! Hope it survives Terra - just keep an eye on it, the one I had died very slowly, the leaves went yellow before finally dropping off and the branches died back - so you should get lots of warning. - fingers and toes crossed for you! Mine is flowering as you know TT. It is in full sun as well, no option for shade. Yes, my Chaenomeles seems to like the sunshine. Those are are just Gorgous Terra, itrs hard to believe they are blooming at the moment. my garden is in a deep sleep, can't say I blame it in this dreadful weather! I checked these Quince flowers today, and so far they have survived the storms ! I've just had a hectic day following the storms.. I reckon I was thinking of my "Neighbours from Trell" who keep pulling down my fence near that Quince ! What a `pick me up` at this time of year, not a glimmer of a flower on my orange one. This is still covered in flowers, despite the recent storms. The very mild weather all over the northern hemisphere is causing many plants to bloom very early. We've had some really hot weather here in San Diego over the last 16 days. We've had some temps up to 94ºF./35ºC. in areas...which is really unusual for the first few days of January. I don't take Puccini out when it's this hot. He hates the hot weather! Yes, Puccini would love it there in England! Delonix ... Please tell Puccini the English weather today is sunny but not too warm ! This quince has gone crazy this year. Buds everywhere for weeks on end... Lol. Lovely flowers and so early. My neighbour gives me her quinces and I make jelly with them. Gerry is eating through the last jar of it. I give her a jar in return as usually only makes 3 - 4 jars. Well done Linda on making the quince jelly. Maybe better to move your Dad's Chaenomeles after the possible frosts of February..
Thankyou Terra,will take my pruners up next time I go.. I took a few cuttings from the neighbours bush but don't know if they have taken yet as they only look like sticks at the moment. Beautiful...mines not in flower yet! ...been flowering away all winter ! do you get fruit on yours Terra? Can I grow new baby quinces from the fruits ? Nice to see this one again Terra..
That's a pity these don't survive in Uttarpradesh. I guess you can compensate by growing other shrubs which wouldn't survive in the UK ? These flowered for months, all through the cold winter ! beautiful climber and lovely bright blooms.